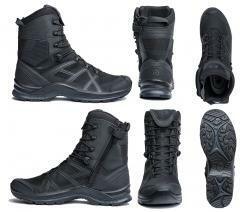 You take a sneaker, a bunch of German engineering, a traditional combat boot and mix them together. The result: high-shaft boots that work like running shoes, made extremely well of modern materials. This variant has mostly synthetic materials and a side-zipper for ease of use. 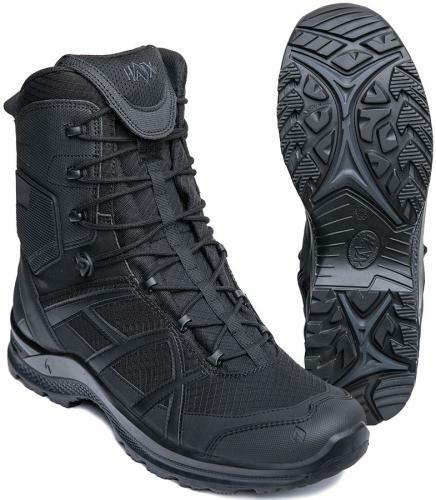 Black Eagle is the newer, athletic, sexier and lighter product line from Haix. 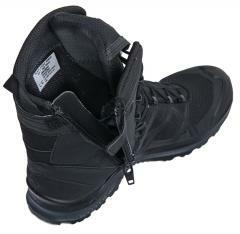 Excellent fit, very intricately designed sole and tested materials make a versatile lightweight boot. It's also antistatic and the zipper is the only metallic part. Probably the most intricately designed sole of Haix lineup - contains overall 10 components of cushioning and stiffening parts in a well balanced mix, and the outer sole not only has a good grip, but provides further protection for the nose. Haix advertises a nice grip on winter season too. The insoles are equally fancy with some shock absorption and moisture wicking properties. Wash them in 30 degrees Celsius occasionally. Brush dirt off, wipe with a moist rag and treat the boots with a suitable spray to repel dirt and water. It's best to take the insoles out of the boots after use to accelerate drying. We suggest not to dry the boots (or any footwear for that matter) near a strong heat source. First the UK size, then comparable Euro size in brackets. The last width on these is somewhat closer to regular than wide. In other words it should fit most people. All HAIX footwear come with a one year warranty. The warranty will be handled by C.P.E. 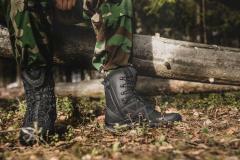 Sales Finland Oy - you will receive a warranty card with your HAIX boots, save it along with our receipt. We do not handle international warranties or warranties for HAIX footwear not bought from us.